Gary started in the automotive retail industry in 1980. His diligence and expert buying skills set him apart in this challenging industry. In 1999 he was afforded the opportunity to obtain the Ford Dealership in Denison, TX. In time he added four more dealerships in the North Texas and Oklahoma area. During his time as a dealer Gary and his team received numerous awards, including the prestigious Ford President’s Award. During Gary’s time as a dealer, he saw a need for a high quality, professionally operated auto hauler for dealers. In 2005, Gary formed Moore Transport of Tulsa, LLC. 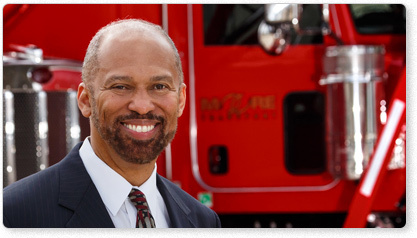 In his current role, Gary takes responsibility of the overall vision and leadership of Moore Transport. In addition he is entirely responsible for all fleet additions and all other CAPEX purchases. He is actively involved in the business and takes pride in knowing each of his employees at a personal level.